Image credit: All images/logos the property of their respective owners. I'm not sure where it comes from, but there's a popular saying that goes something like this: "If you don't like the weather in Texas, wait five minutes and it's bound to change." Looking back on recent history it seems like a similar sentiment applies when it comes to craft beer. Hardly a week goes by that we don't see a debut of some sort here in the Metroplex. Whether it's a new brewery, a new beer, a new pub or a new festival, it feels like we've been celebrating something new to North Texas virtually non-stop over the past year. Some of what's new (out-of-state brands, pub/restaurant/taproom openings, our growing festival culture) was discussed in last month's "North Texas Craft Beer State of the Union." Appropriately enough, though, even that article is already out-of-date. Still, I'll take care not to repeat myself as I recount what's gone on in the local craft beer scene over the past 12 months. As of this weekend, there will be 16 production breweries operating in North Texas. A month ago there were 13. A year ago? 9. Who's new? The list of newcomers includes Community, Independent Ale Works, Martin House, 903 Brewers, Grapevine Craft Brewery, Rabbit Hole and Cobra. Oh, and let's not forget Armadillo Ale Works. While they may not have their own space (their products are brewed at the Deep Ellum Brewing Company), they still represent a new craft beer brand in the Metroplex. As for the future, there are at least three more breweries on the horizon with Noble Rey, Shannon and Wahoo securing sites in recent months. What about brewpubs? Well, Zio Carlo began brewing operations mid-year, eventually releasing their first beers in September. They may be the only fresh face for 2013, but the new year holds promise given the news surrounding developments like BrainDead Brewing in Deep Ellum, and the Small Brewpub planned for Jefferson Tower. And yes, there's that other project going on in Irving, but based on the imagery they regularly post to their Facebook page it's difficult to take them seriously. While we're on the topic of active breweries, let's see how the Metroplex fares against the Brewers Association's 10-mile measuring stick. That is, do most North Texans live within 10 miles of a brewery? Looking at map of our region in January of 2013, even if we treat Cedar Creek and Revolver as outliers there was a lot of open space in the northwestern part of town. You'll also notice that there's just enough distance between Franconia and FireWheel to create a small gap in East Plano. Remember the BA counts breweries and brewpubs as one in the same, which explains why Arlington (Humperdinks), Grapevine (Uncle Buck's) and West Plano (Gordon Biersch) have coverage. Update this with openings throughout the year and the Metroplex starts to measure up, at least in the areas immediately surrounding Dallas and Fort Worth (here again we take 903 to be an outlier). There's still a small sliver near Keller, but Shannon Brewing should have that taken care of in early 2014. As for the expanse along U.S. 380, someday we expect Armadillo to make their move to Denton and there just so happens to be a brewery being developed in Frisco (shhhh!). And, that spot in East Plano? Rumor has it there's a group seeking investors in Allen. Opening a brewery and landing your first draft account is an achievement all to itself, but for many brewers the next big push is to get their beer into retail. Twelve months ago only beers from Rahr, Deep Ellum and Lakewood (just barely) were available in bottles or cans. Now, that list of names includes Armadillo (cans), Cedar Creek (cans), Revolver (bottles), Community (bottles), Martin House (cans) and Franconia (bottles). Plans are in the works for Four Corners (cans) to join the party in 2014, and we'll even see new packaging from Rahr. The area's oldest craft brewery is looking to make a partial move to cans in the early part of the coming year, and will even produce a new American-style pale ale to be released exclusively in this form. It wouldn't be much of a celebration of the past year if we didn't mention 2013's award-winning brews. By now, you surely know that Cedar Creek (for their Dubbel) and Community (for their Public Ale) brought home gold medals from the Great American Beer Festival, continuing what we hope is a trend started by Peticolas following his win in 2012. But, that isn't the only competition local brewers entered this year. I won't post an exhaustive list but it's worth noting individual awards received by North Texas breweries at the United States Beer Tasting Championship (Community, Peticolas, Rahr, Revolver), the United States Open Beer Championship (Community, Peticolas, Rahr) and the San Diego International Beer Competition (Lakewood). While a number of breweries reached their first anniversary this year, I'm going to focus on the old guard for this segment. Why? Because in the micro/craft brewing era (post-1976), only five North Texas production breweries have stayed in business for at least five years. The first of these was the Reinheitsgebot (Plano, 1982-1990), followed by the Dallas/Texas Brewing Company (Dallas, 1989-1996) and Great Grains (Dallas/Fort Worth, 1997-2004). The other two are Rahr and Franconia (who attained the five-year mark in February). They are also the only members of the group still in existence. Staying in business for five years is clearly no small feat. The five breweries mentioned above made it, but another five breweries you've probably never heard of didn't (Addison Brewing, St. Andrews, Main Street, Texas Beer Company, Healthy Brew). Ten Years? That's something else entirely. Rahr, who recently celebrated their ninth anniversary, is on track to be the first local micro/craft brewery to ever make it to ten years. Here's where we review some of the best beers new to Texas. New meaning it was either brewed or sold in the state for the first time in 2013. Now, I've never been one to do a year-end top ten list, and this time it's not going to be any different. 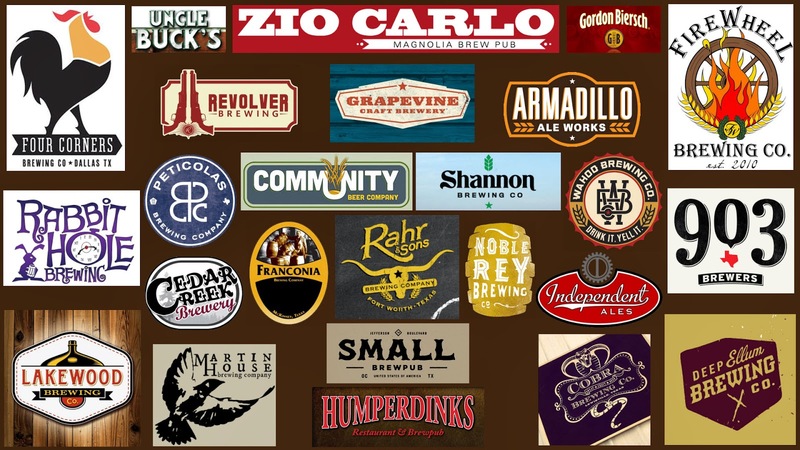 For one thing, just look at some of the national brands that began distributing their beer to the Lone Star State. How do you make a top ten list out of that? That doesn't even include new products I enjoyed from out-of-state brewers with established distribution. That's a list of 21 beers, with locals still left to consider. Top ten list? No thanks. What I will do, though, is select a few categories and pick the new beers I think best represents them. It's basically what I've always done before, except this time (in light of the above list) choices will only come from Texas. Although the name might suggest otherwise, Community's Mosaic IPA is not a single hop beer. Rather, it's a blend of several "delicious American hop varieties" with notes of tropical fruit, citrus, blueberry and a touch of herbs. When it first came out, it essentially took over one of my growlers. Now that it's available in the convenience of a 6-pack, it's even easier to keep on hand at home. Poor Alfred Brown, he never stood a chance up against his heavy hitting brethren when Peticolas took a poll for what should be the brewery's next year-round beer. I had high hopes, mostly because this beer takes me back to when I was first getting into craft beer. It reminds me of Samuel Smith's Nut Brown Ale, a classic I counted among my favorites early on. Goatman lands here for the same reason Chatoe Rogue Dirtoir did last year; there's so much flavor you almost forget it's a lager. This dank and resinous schwarzbier-ian brew was just one of the great beers to come out of Lakewood's Legendary Series this year. I could have singled-out any number of beers for this category, but it's hard to ignore when people and your own taste buds keep telling you Franconia DIPA is the best beer on the floor at the Big Texas Beer Fest. In a year when the brewery went off the grid and off the map, this beer was one of their best. Barrel-aging isn't just about bourbon, and there are times I think I may enjoy the nuances red wine barrels bring to beer as much or more. Whichever you prefer, the beers mentioned here are outstanding examples of either approach. My first chance to try this beer came during Fort Worth's Untapped Festival in April. I wasn't a fan. It was a little too sweet and a little too bitter for my taste. So much for first impressions. I kept coming back to it, though, thanks in no small part to Craft and Growler keeping it on tap in perpetuity. Every month I'd try it again, only filling small growlers with it at first and then stepping up to larger ones. It just kept getting better and better and better. After countless pints, it gets my vote as North Texas' best for 2013. This is an amazing Article, we had the Wahoo guys on our Podcast, and we talk Texas craft beer all the time!! Thanks Jason! Wahoo is an interesting story, they are moving into the building once occupied by both the Texas Beer Company and later Great Grains.